Our Science Question is an opportunity for all pupils to use independent research to provoke discussion and stimulate scientific thinking. Science Question is taking a break during Spring 2 term, but will be back in Summer 1 – please visit us then! The question is set on a Tuesday/Wednesday, and can be seen on this webpage and on the Science noticeboard in the main corridor (opposite Birch Class). Answers are due ten days later on Thursday, and should be written in a speech bubble and placed on the noticeboard. The best answers are awarded a certificate, which will be presented in assembly. It’s easy to think that electricity starts at the power supply and goes through each lamp in turn, so that lamps nearer the power supply will be brighter than those further away. This is not correct. The electricity flows through each part of the circuit at the same time. 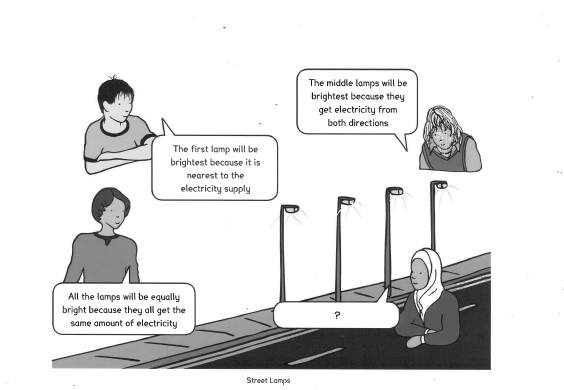 All the lamps receive the same amount of electricity. Street lights are wired so that all the lights stay on when one light stops working.